Jump in with the kids, or park yourself outside of the splash zone and catch up on some much-neglected reading. From full kitchen to balcony or patio, this place has it all. After all, there's no such thing as too much green. Play a round of tennis or a match of chess. The resort has you covered. You're just a 14 minute drive to Orange Lake Golf Club. Every unit has its own patio, perfect for leisurely flipping through a magazine on a relaxing afternoon. Orlando International Resort Club is located in the heart of Orlando near the area’s best attractions. Don’t bother unpacking once you get to your condo, just get changed into swimsuits and get ready to hit the outdoor pool. Go for a swim or relax poolside with that book you’ve been meaning to finish. When it’s time for lunch, take advantage of the bbq grills and have a family picnic. Recruit the little ones to help carry burgers, hot dogs and side-dishes. Then lay out the condiments and toppings and let everyone go wild. After lunch, let the kids run off their energy on the playground while you get in a quick workout at the fitness center. Or get in touch with your inner athlete at the tennis and basketball courts. Spacious two-bedroom condos sleep six guests with enough room for the kids and all of their toys, blankets and stuffed animals. Fully equipped kitchens allow you to save money by making your own meals. Take the kids along to Publix to make sure that no one’s favorites are forgotten. The kids will be begging to help bake your famous chocolate fudge brownies (and be the official taste testers). And freezers are perfect for storing dessert – popsicles for the kids (and a Ben & Jerry’s stash for the grown-ups). You’ll be thankful for the in-suite washer/dryer when you see the chocolate all over the kids’ clothes. Throw in a load of laundry while the kids watch cartoons on the cable TV. 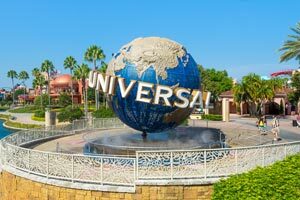 A visit to Universal Orlando® is a must for movie lovers. Universal Studios® is the home to E.T. Adventure®, Transformers: The Ride 3D® and The Simpsons Ride®. Harry Potter fans will love The Wizarding World of Harry Potter®. Diagon Alley is located in Universal Studios® and features Harry Potter and the Escape from Gringotts and Flight of the Hippogriff. Head to King’s Cross Station to hop aboard the Hogwarts Express (with a park-to-park admission ticket) for a visit to Hogsmeade in Universal’s Islands of Adventure®. Ride Harry Potter and the Forbidden Journey or dine at Three Broomsticks. Universal’s Islands of Adventure® is also where you will find the Jurassic Park River Adventure®, The Amazing Adventures of Spider-Man® and Skull Island: Reign of Kong®. SeaWorld® features shows and animal experiences with dolphins, sea lions and penguins. Rides include Mako – Orlando’s tallest, fastest and longest roller coaster and the kid-friendly roller coaster, Shamu’s Happy Harbor. Walt Disney World’s® Magic Kingdom® is home to some of Disney’s most classic attractions. Fly with Dumbo, party with 999 happy haunts in the Haunted Mansion or join a Skipper on a cruise through the jungle. Dine in the Beast’s castle at Be Our Guest, located in New Fantasyland and ride the Seven Dwarves Mine Train. - Front desk is open 7:00 AM-10:00 PM daily. Guests that are planning to arrive late can pick up keys from security in lobby. For more details please contact the property using information on the booking confirmation.